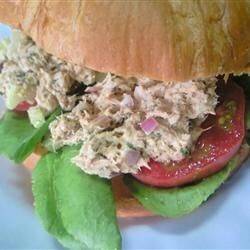 "I love creating new variations on tuna sandwiches. I made this for my husband's lunch the other day, and he wanted them again for dinner that night! When I made this, I didn't measure anything, just started throwing things in a bowl...adjust to your taste and enjoy!" In a medium bowl, mix together tuna, mayonnaise, mustard, pesto, and garlic. Make four sandwiches by layering tuna, lettuce, and tomato slices between slices of bread. Serve. My husband, who doesn't even like tuna, liked this recipe. I don't eat tuna any other way now. pesto....tuna....mustard? you say crazy, I say DELISH! I was pleasantly surprised with this recipe. I forgot to add the mustard and it was still delicious. I served on toasted whole wheat bread and put just a bit extra pesto (I really love pesto). I would never have thought to put pesto and tuna together but it works and is yummy! Thanks for the new twist on tuna salad sandwiches!